Just minutes from Port Canaveral on sunny Florida's Space Coast, Historic Cocoa Village is one of Brevard County's many treasures. There is so much to see and do that it is well worth visiting and revisiting again and again throughout the year. There is something for everyone. From the eclectic community theater to the stylish, upscale restaurants to the quaint bars to the specialty shops, dance studios, antique stores, art galleries, boutiques, historic buildings, seasonal festivals, community murals and waterfront park, Cocoa Village will keep you coming back for more. For History Lovers: The Cocoa Village Playhouse was built in 1924 in the Italian Renaissance style for approximately $80,000.00. It was one of the finest theaters in the state at the time. It is listed on the National Register of Historic Places and has been restored to its original splendor. The Porcher House is the "grand neoclassic building" at 434 Delannoy Avenue . It was built in 1916 by Edward Postell Porcher, a pioneer in the citrus industry. The beautiful home incorporates coquina block construction and was designed by his wife, Byrnina Maria Peck Porcher. Local builder Harry Routzong, knowing Mrs. Porcher's love of card games, cut coquina stones into the shapes of hearts, diamonds, spades and clubs as a surprise for her. See if you can find them on the front walls. Listed on the National Register of Historic Places, it is used for weddings, business meetings, family gatherings, engagement parties and many other events and celebrations. The Porcher House is open for public visits Monday through Friday. 9am - 5pm. 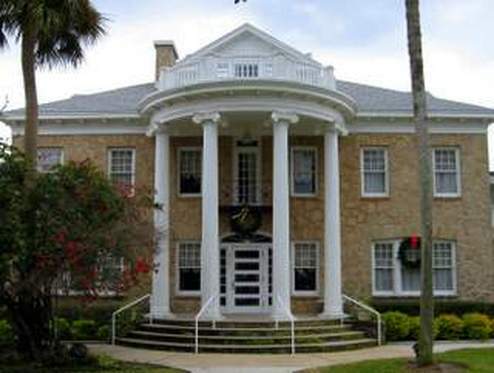 The Florida Historical Society Libary of Florida History is located in the historical former post office. They collect historical documents and maps relating to Florida . The collection consists of over six thousand volumes, an extensive map collection, manuscripts, photographs, the Mosquito Beaters historical collection, the Alice Strickland collections of Floridiana and a bookstore. For Antique Lovers: Would you enjoy a leisurely day strolling tree-lined streets as you browsed antique store after antique store? Then you will love Cocoa Village . It boasts nearly a dozen antique stores where you can browse and buy until your heart is content. A Park for Relaxation and Rejuvanation: Riverfront Park is a great place to bring your children or grandchildren or to relax and take in the serenity of the river view. Riverfront, Lee Wenner and Taylor Parks, offer nearly 10 acres of prime riverfront land with pavilions, benches, beautiful landscaping, an amphitheater, a boardwalk, and a fountain the kids can play in until they are soaking wet and all giggled out. For Festival Lovers: Cocoa Village offers numerous festivals, fairs and events throughout the year. These well-attended events are a great way to spend a meandering morning, afternoon or even evening. The Cocoa Village Fall Craft Fair is held in each October and the Cocoa Village Holiday Craft Fair is scheduled feach December. More than 250 exhibitors display their talents in all price ranges. There is a food court serving a variety of foods, and children's bounce house for the kids. Admission is free. Craft fairs are often scheduled for March and May as well. There are also yearly celebrations for select holidays including the Fourth of July, Mardi Gras, First Night and Memorial Day. For Art Lovers: Cocoa Village has a well-deserved reputation as an artistic haven. From the Cocoa Village Playhouse to the art galleries to the dance studio, art is alive in historic Cocoa. So you think you can dance? Holly Horans Fuzion Dance Centre provides a non-intimidating environment that allows children and teens to work on all aspects of ballet, modern, classical, lyrical, jazz & hip-hop training. Students have won first place in regional, state and national dance competitions and even gone on to be students of the Joffrey Ballet School and Julliard. The Cocoa Village Playhouse entertains over 55,000 people each year with five large musical productions, twelve Brevard Ballet Theatre performances, and three children's productions. The Playhouse boasts a cast of over 600 volunteer performers, artists, technicians, and ushers that give more 100,000 accredited community service hours each year. Visit CocoaVillagePlayhouse.com for scheduled performances. Visit CocoaVillage.com/directory/art_galleries to see a current list of the many galleries where you can browse or purchase your favorite art form. For Food Lovers: From the down-home atmosphere of Murdoch's to the upscale ambience of Cafe Margeaux, you never have to go hungry or thirsty in Cocoa Village. Cafe Margeaux offers Classical French and Northern Italian cuisine in a New Orleans setting with romantic indoor or al fresco dining that included fresh local and imported fish, veal, duck, quail, and exotic salads. Murdoch's, with its walls of antique windows, old fashioned bar, open mic nights and fixtures salvaged from the Historic Brevard Hotel, is a great place for a beer and a burger. In conclusion: From the eclectic community theater to the stylish, upscale restaurants to the quaint bars to the specialty shops, dance studios, antique stores, art galleries, boutiques, historic buildings, seasonal festivals, community murals, waterfront park - there is something for everyone in historic Cocoa Village. Watch a video of Cocoa Village attractions below.